Formed in 2007 by thirty of Thailand’s wealthiest people, Ayodhya Links is one of the most exclusive golf clubs in Asia. Membership to the club is by invitation so only the great and the good of Thai society mingle in the clubhouse – and unless you’re closely acquainted with one of these invitees, don’t hold your breath on getting a game here anytime soon. The design company of Thomson and Perrett drafted the ground plan, but the finished article was created by the current Owner/Chairman, Pitak Intrawityanunt, and he’s produced a tough track where water lies in wait at each and every one of the eighteen holes on the scorecard. If you add rolling fairways, lightning fast greens and a variety of deep bunkers into the golfing mix then it’s easy to see why Ayodhya is regarded as a real test of golf. The course measures a fearsome 7,639 yards from the championship tees and only one of the ten par fours on the card plays less than 400 yards in length from these back markers. Fortunately, there are five sets of tees at every hole so casual play from the red or yellow pegs is never an ordeal. If you have somehow managed to play the course, we’d love you to post a review. I had the pleasure of taking a much too short trip North of Bangkok to visit Ayodhya Links recently. It’s located in a perfectly flat swamp area in Thailand, not a hill to be found. What they have managed to do with the land they built on is nothing short of a miracle. Ayodhya is a course full of water, in fact, water comes into play on nearly every hole. It’s an extremely challenging layout with World Class greens and surrounds. The course is full of subtlety and wonderful bunkering. I will say it’s a course that needs to be played several times to really get and try to understand all the strategy built into the holes. The green complexes are so outstanding that pin placement truly determines where you must place your drive to have a solid shot at par or better. The property is huge and the course is very walkable with the routing from green to tee being well thought out. Visually there is nothing spectacular about the property yet the brilliance of Ayodhya lies in the architecture and what’s been accomplished there. Hats off to Mr. Pitak for this great accomplishment. Our host suggested he always wants the greens to run faster, however at 10 on the stimp I was more than satisfied, faster would certainly eliminate a lot of pin positions as they are full of internal contours. Approaches from the wrong area result in all but the most brilliant shots being left with delicate recovery shots and it’s quite easy to run up a big score around the greens. Ayodhya Links is certainly the best course in Thailand and one of the gems in Asia. It’s been voted into the World Top 100 Courses, while that inclusion and resulting position could be challenged it’s certainly a course that should be a serious contender and a course I would love to play several more times. The Ayodhya Links Golf Course is located above a vast marshland has been dug up and turned into an undulating terrain. The streams and lakes, which lie throughout the course, are made by pumping up water from under the ground. 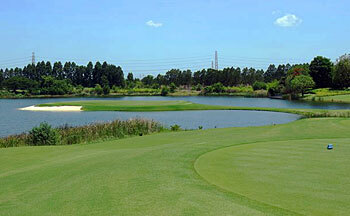 Although the land is large enough to build 36 holes, this course only has a total of 18 holes. The course consists of quite a lot of memorable and impressive holes, many of which end up being unique in their own special way. The course distance itself totals more than 7,600 yards. There are many strategically placed bunkers and water hazards throughout this extremely long course making it very challenging for both amateurs and professionals. The greens’ surfaces are boldly undulated and highly contoured, making the overall putting experience very difficult. Players won't be able to see any man-made structures except for the clubhouse. The playing intervals off the first tee are every 15 minutes, double that of many other regular courses. Players will seldom encounter the front and back groups during their play, making the players feel as if they are occupying the entire course themselves. A combination of solitude and natural beauty will make players feel as if they are playing in a paradise & utopian world. Ayodhya Links proves to be at the frontier of eco-friendliness, as the club only uses organic fertilizers, as supposed to chemically produced ones, when maintaining their course. During the winter, migratory birds, some traveling from as far as Alaska, may be seen at this golf course. While regular courses just install a few kilometer-long drainage, Ayodhya Links has a whopping 70 kilometer-long drainage system underneath the entire course, allowing golf carts to be able to be driven onto the fairway, even during heavy rains. The par 4 496-yard 9th is very long with a dogleg to the left. A large mound in the center will force players to decide whether to hit towards the left or right. Aiming towards the left will allow a shorter play, but at a higher risk as the narrow fairway borders a lake and a long beach bunker. Aiming towards the right will require a longer play but be less of a risk as there is only one bunker that is placed about 270 yards from the tee. Despite the direction, the longer the tee shot is hit, the narrower both the fairway and the landing area becomes. The second shot will be very demanding due to the fact that the green is guarded by a huge bunker both at the front and right hand sides. There is also a body of water in front of the green which players should avoid. Players will need to make a decision whether to carry their ball over the hazards, or to play it safe and hit towards the right side of the green. The green slopes from the top left to the bottom right and has a horizontal ridge that runs through the center, making it very difficult to putt. If the ball lands on the opposite side of the ridge in relation to the hole, putting will become a big challenge. The par 3 188-yard 12th is a picturesque hole that is designed on top of an island green. The green is surrounded by a body of water and a total of three bunkers; two on the right and one at the back. The green is deep and around 40-yard wide. There are three distinct putting surfaces; two higher levels on the left and right, and a concave center. The putting from different levels offers another challenge to players. Though Peter Thomson and Ross Perrett were the original creators of the course’s ground plan, it was Pitak Intrawityanunt, the current owner/chairman, who completed the detailed design of the course. I am highly impressed that Mr. Intrawityanunt, back then an amateur course designer, was able to create a course that ultimately ended up being what is generally accepted as one of the top hundred courses in the world. Over the past couple of years, I’ve had the honor of getting to know Chairman Pitak and have managed to understand and highly respect his knowledge on topics such as the architectural complexity of course design and his wealth of insight on the importance of green and fairway maintenance. To read more about the Ayodhya Links, click here to visit my website. A review of a private course? Ridiculous and absolutely useless for "normal" golfers. I'd suggest you to send a course tester (or go by yourself) to Black Mountain: that's the real no. 1 in Thailand. An excellent course with pristine condition greens and fairways! Also very fast, challenging putting greens with unpredictable wind conditions. Total exclusivity every time I've played. Tough course, still trying to break 80. A must-play course when in Thailand. You enjoyed the Total Exclusivity but regard it a 'must-play' course? How do normal golfers like us play?